eastboston.com, est. 1995 and edited by Frank Conte, updated daily! This is archived material from eastboston.com. The event took place in 1996. Hugh O'Brien...Maverick ... Daniel Webster...Noddle Island... 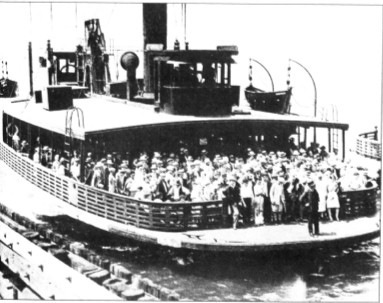 The People's Ferry. The history of both Boston proper and East Boston are reflected in the names of the ferry boats that from 1834 to 1952 provided transportation for this island community. The exhibition, which opened last September, corresponds to the re-establishment of last year's water transport service to East Boston by the MBTA and the City of Boston. "The Penny Ferry" exhibition uses the story of the East Boston ferries to examine the residential and commercial growth of the district and puts the current restored water transport into historical perspective. Photographic images, documents, early prints, artifacts and graphics illustrate the historical role of the ferries in lives of its residents. The ferries, their passengers and their crews are the centerpiece of the exhibition. Beyond the historical perspective, the exhibition explores the rich lore and powerful meaning of the ferries in the everyday life and imagination of the East Boston community, even to this day. The last East Boston ferry ceased operation in 1952. Yet the ferries remained a significant part of East Boston lore, fondly remembered and lamented by many members of the community. East Bostonians remember riding the ferry to escape sweltering summer days in the city. In the days when sea air was believed to be recuperative, mothers took their children to ride out a childhood illness. Others recall the dog who delivered a picnic lunch to his master every day by ferry boat and the horse who delivered her foal on board! The Old State House Museum is open daily from 9:30 a.m. to 5:00 p.m. and is located at the corner of State and Washington Streets in downtown Boston. "The Penny Ferry" exhibition runs through July 1996. Admission is $3 for adults; $2.00 for older adults; $1.50 for children (6-18) and free for Massachusetts schoolchildren and Boston older adults. For information, please call 617/720-3290. The Old State is operated as a museum of Boston history by The Bostonian Society, Boston's famous historical society.